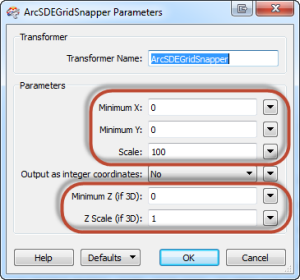 The ArcSDEGridSnapper transformer is useful in verifying what the data will look like once it is in an ArcSDE. This transformer simulates the ArcSDE conversion on a feature by performing ArcSDE translation, scaling, and coordinate snapping. It also removes duplicate vertices resulting from snapping multiple formerly separate vertices to the same grid point. These coordinates will also be recorded in a list attribute. If the feature was an aggregate feature, the ArcSDE conversion is executed individually on each geometry in the aggregate feature. The ArcSDEGridSnapper simulates coordinate transformation and records duplicates. It will snap all feature coordinates to match the precision specified, thus making the feature compatible with your ArcSDE database. It's a much preferable alternative to the CoordinateRounder. 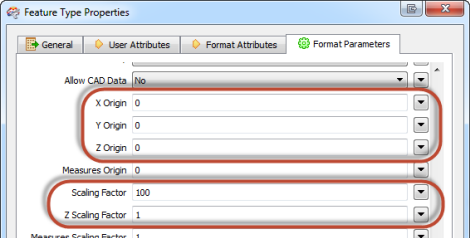 By quickly simulating data conversion to ArcSDE, the ArcSDEGridSnapper allows for the analysis of data accuracy. The problematic data output from the ArcSDEGridSnapper can be further processed in the workspace (removal of dangles/sliver polygons for example) before the data is loaded into SDE. Writing to SDE is not always simple. Coordinates in low precision are stored in the database as 31 bit positive integers. Features will be rejected where their coordinates have a greater precision than is allowed for in the database. When snapping features to the SDE grid, self-intersections can be introduced by ArcSDE itself! The ArcSDE simulation is executed only when all coordinates of the geometry are within the valid range defined by the ArcSDE format. Otherwise, the conversion is cancelled and the error attribute '_ArcSDE_Error' is added to the feature. Currently, the only value of the error attribute is 'out of bounds', which occurs when a geometry contains a coordinate that lays outside the calculated domain. Note that illegal geometries, such as areas with dangles, will not be checked for validity on the ArcSDE format. Arcs and ellipses passed through the ArcSDEGridSnapper will be stroked into lines; this matches the behavior of the ArcSDE writer, which does not support the storage of these types of geometries. As of FME 2013 SP1, the ArcSDEGridSnapper supports the high precision coordinates available in ArcGIS 9.3 or higher. 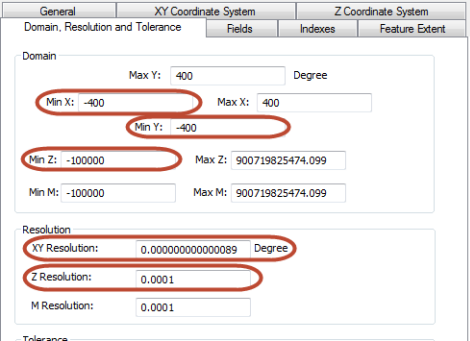 The ArcSDEGridSnapper parameters require a false origin for x,y,z coordinate values and a scale factor. The below table is a general guideline on how to set the values of the ArcSDEGridSnapper, and how these map to the values defined in ArcMap and the FME Geodatabase or ArcSDE writer. In ArcMap, select a feature class. Right click -> Properties and select the Domain, Resolution and Tolerance tab.